1. The V-Rod has been put out to pasture, and the 2019 Harley-Davidson FXDR 114 alone fills the power cruiser role. Those are some big shoes to fill. Luckily, the FXDR is making those boots burst at the seams with a power cruiser that not only has excellent power, but also handling abilities. 2. The air/oil-cooled 114ci powerplant powers the drag-inspired FXDR. Rumbling at the center of the 2019 FXDR is the undeniably stout 114ci Milwaukee-Eight V-twin powerplant. It’s also the most potent piece of firepower in the Softail lineup, producing a claimed 119 ft/lbs at just 3500 rpm. When the light goes green, you’ll feel all 114 cubic inches mightily leap into action. It hurls the FXDR down the road without any hesitation in fueling, pulling all the way to the 5500 rpm redline—something you might start banging off if you can’t get enough of the ample power on tap. 3. 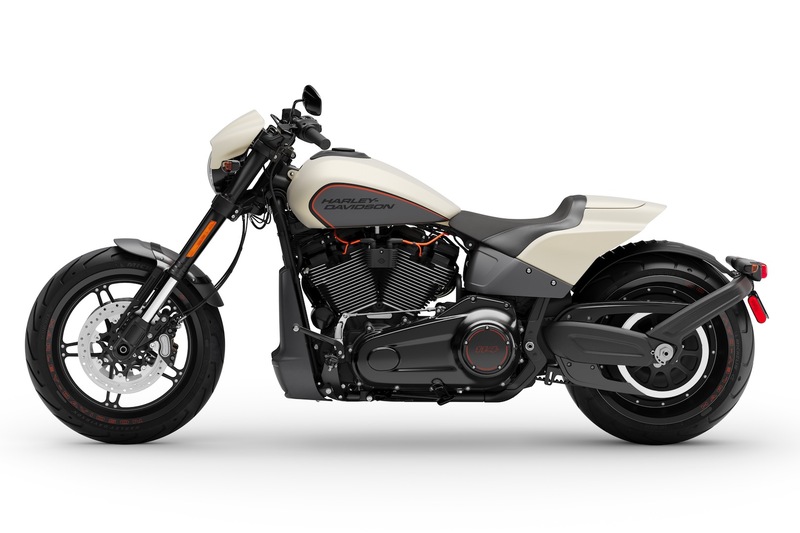 The FXDR is in Harley-Davidson’s not-so-soft Softail. Officially, the FXDR is part of the Softail lineup, but it’s a different beast altogether. H-D designers aimed to bridge the gaps between their heritage, modern styling, and that of a thoroughbred power cruiser. The air cleaner was ripped right out of H-D’s rich history, taking inspiration from World Champion Screamin’ Eagle/Vance & Hines drag bikes, while the 2-into-1 exhaust system would be at home on any Italian machine from this decade. If anything, it’s a strong signal that Harley-Davidson is serious about change. 4. An all-aluminum swingarm is bolted onto the FXDR. Saving a claimed 10 pounds compared to a steel unit, the aluminum swingarm serves a few purposes in this new power cruiser. The standard steel-tube Softail swingarm does not provide enough chassis rigidity for this role. Although I enjoyed the full range of Softails when they launched last year, this is a step forward in stiffness. Secondly, the swingarm needed to accommodate the beefy 240mm rear tire. Lastly, the new swingarm allows for optimized chassis geometry to give the FXDR something the V-Rod couldn’t claim—handling. 5. Drop the FXDR into any corner of your choice; it was built for it. At lower speeds, the FXDR weaves around the streets gently enough. However, at pace it likes a bit of input before making use of the edges of the 240mm tire and wailing through the canyon roads. Under acceleration, the sizeable 668-pounder provides loads of stability, allowing riders to eagerly get on the gas and lunge towards your next turn. With the forward controls and lean angles just shy of 33 degrees, you’ll have plenty of room to get loose. Typical of feet-forward pegs, the first thing that will scrape the tarmac is the heel of your boots. 6. Harley-Davidson managed to make the FXDR 114 handle. The FXDR looks low, long, and raked out. At 34 degrees, the FXDR features the same rake as the Breakout. To counteract that, the FXDR features an inch less trail than the Breakout. H-D came to this by giving the FXDR its own specific set of beautifully machined aluminum triple trees. They draw the fork closer to the head stock, thus reducing the trail and make it far more apt to leaning without sacrificing its stability. 7. The new power cruiser gets new suspension. Up front, that means a non-adjustable 43mm inverted fork featuring cartridge damping and five inches of travel, which you’ll make use of. Under heavy braking, I found the fork leans towards the softer side and allows for a bit of dive. In the rear, a revised shock is bolted onto the FXDR, with remote spring-preload adjustment and 3.4-inches of travel. The shock is noticeably stiffer than the fork, and helps maintain the FXDR 114’s composure when railing through corners. In the weather-battered Milwaukee streets, it does sometimes translate to energy transferred into the rider. 8. FXDR hit the gym and cut the fat in several ways. In running order, the 2019 Harley-Davidson FXDR weighs a claimed 668 pounds. In the sportbike world, that’s portly, but in the big-twin cruiser world, that is fighting weight. In many areas of the bike, such as the tail section and fenders, H-D opted for composite materials instead of traditional steel—that saved about seven pounds. The subframe is made from aluminum, shedding even more weight. The aluminum wheels were also shaved down to cut pounds. 9. The FXDR’s 28.5-inch seat height means many riders will have no issue touching their boots to the ground and gaining confidence. 10. This motorcycle has ergonomics that reflect its personality. The FXDR 114’s broad-shouldered stance, with your legs up on forward controls, fits the bill when it comes to the aesthetics. However, it can be demanding on the rider over an extended ride. The ergonomics hinge you at the waist and reduce the amount of weight that can be distributed through your legs. That said, we’ve already seen a few custom builders mockup mid controls on the FXDR, which is what I would have preferred. The seat itself is comfy, but you will have to leave your partner at home—it’s a single-rider machine. 11. There’s more than enough stopping power on tap. Featuring dual 300mm rotors up front that are gripped upon by four-piston calipers, feel at the lever is lighter than what I am used to on most Harley-Davidson motorcycles. Getting the FXDR stopped, finessing the brakes in traffic, or trail braking into corners, requires less effort overall while also providing good feel. In the rear, a single 292mm rotor is paired with a dual-piston caliper and can be modulated easily enough, partly thanks to the fat 240 rear rubber. 12. Michelin Scorcher 11 tires provide needed grip. Rain or shine, the Michelin Scorcher 11s held their own. With a 240mm tire in the rear, you are a little limited for replacements once these wear to the cords. Fortunately, the performance is matched to the needs of the FXDR well. 13. A simple dash gets the job done. The bike’s interface is utilitarian, and in 2018, I’ve come to expect gorgeous TFT displays. The LCD dash does feel a bit inadequate in comparison to the Touring bikes that feature just such tech. Hopefully, the FXDR can get the same treatment at some point. As it stands, it features a fuel-gauge and gear indicator—my two biggest desires with any motorcycle. So, while I would like a TFT display, this does just fine. 14. The 2019 Harley-Davidson FXDR is America’s power cruiser. Sure, that’s a bold statement, but also true. No other American manufacturer makes a big-inch power cruiser. While this niche genre might have been one dimensional in the past, the 2019 Harley-Davidson FXDR is helping redefine those boundaries, all while leaving a healthy dark line of rubber in its wake. Next articleLieback’s Lounge: What’s Your Hierarchy of Motorcycle Love?